If you would like to connect with a member of the Alumni Advisory Board or are interested in serving on the board in the future, please contact Yesh Pavlik Slenk. Joe Chavez, was a 2014 EDF Climate Corps fellow with Comcast, and is now the Deputy Director of Optimization/Energy Manager for the NYC Department of Education. 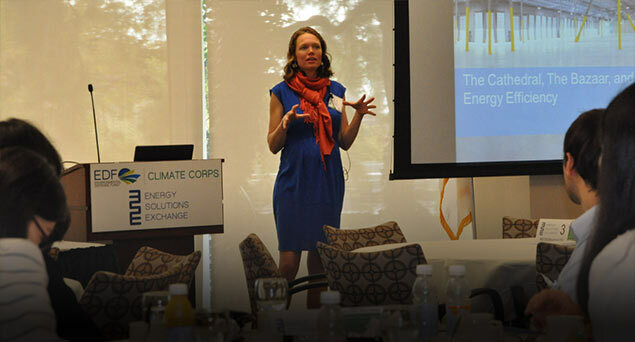 Rachel Finan, was a EDF Climate Corps fellow with UT Southwestern Medical Center in 2014 and is now a Senior Program Manager at National Grid. Dylan Hedrick was a 2010 fellow with ServiceMaster, and now works in Texas as a Project Manager for Halff Associates. Sam Irvine was a fellow with the San Francisco Public Utility Commission in 2015 and is now the Director of Strategy and Partnership at Forsei Consulting in San Francisco. Nicki McClung was a 2014 EDF Climate Corps fellow with the City of Boston and is now a Social Responsibility Specialist at Nordstrom Inc.
Andrea Mengual was a EDF Climate Corps fellow with the Massachusetts Departments of Transportation in 2014 and is now an Energy Engineer at AECOM. Pia Brandt was a 2011 fellow with McDonald’s and is now the Director of Product Marketing for Markforged. Tyler Van Leeuwen was a 2013 EDF Climate Corps fellow with the adidas Group and is now a Group Carbon Opportunities Manager with Shell. Dara Ward was a 2011 EDF Climate Corps fellow with the adidas Group and is now the Energy & Sustainability Manager for the St. Vrain Valley School District in Colorado.